The historic Swiss city of Basel (known as Bâle in French), located along the mighty River Rhine, grazes the border between France and Germany. It is a magnet for lovers of art and architecture, with a wealth of museums, galleries and iconic buildings. However, for something a bit different to do in Basel, look no further than the Rehberger Weg (Rehberger Way). In keeping with the city’s artistic edge, this is a 5km art trail that links Switzerland and Germany and two cultural institutions, the Fondation Beyeler in Riehen and the Vitra Campus in Weil am Rhein. This is a lesson in collaboration: between two countries, two communities and two esteemed art institutions. Combining walking with art, this trail is waymarked with 24 public art installations, created by the eponymous Tobias Rehberger. So is it worth walking the Rehberger Weg? From Bahnhof Basel SBB (Basel’s Swiss station) take tram #2 towards Eglisee to the Basel, Badischer Bahnhof tram stop. Then change to tram #6 towards Riehen Grenze and alight at the Fondation Beyeler tram stop. Note: When I did the Rehberger Weg in 2018, they were working on the tram line and I needed to make some of this journey by bus. However, this work was scheduled for completion in March 2019. If you are feeling peckish, I recommend alighting one stop early at Riehen Dorf and having lunch, washed down with a glass of the excellent local Chardonnay at Restaurant Landgasthof. From here, walking five minutes in the direction of the tram will bring you to Fondation Beyeler. The Fondation Beyeler, a museum of modern and contemporary art, is the starting point for the Rehberger Weg. Considered one of the world’s most beautiful museums, it effectively combines art with nature for a sensory experience. The museum, designed by Renzo Piano, is located in an English park complete with mature trees, and water lily ponds. Take the path behind the museum. You will now amble through open countryside, past fields of corn ten feet high (it was approaching harvest time when I visited). Crossing the River Weise, you reach the deserted border post between Switzerland and Germany, and the sleepy residential streets of Weil am Rhein. Leaving the main street, you walk up a steep hill that brings you to rolling vineyards, each cultivating a different variety of grape. This forms part of the wine-route of Weil, or Weilweg. Eventually, you take a path to your left that winds its way down to the Vitra Campus, which you will be able to see in the distance. The Vitra Campus is best known for two things: its ensemble of contemporary architecture and furniture design, most notably Eames chairs. It is possible to take an architecture tour of the campus. Weil am Rhein train station is a 25-minute walk from the Vitra Campus. Alternatively, bus #55 will bring you there. If you are returning to Basel, take tram #8 from the station. Is it worth walking the Rehberger Weg? 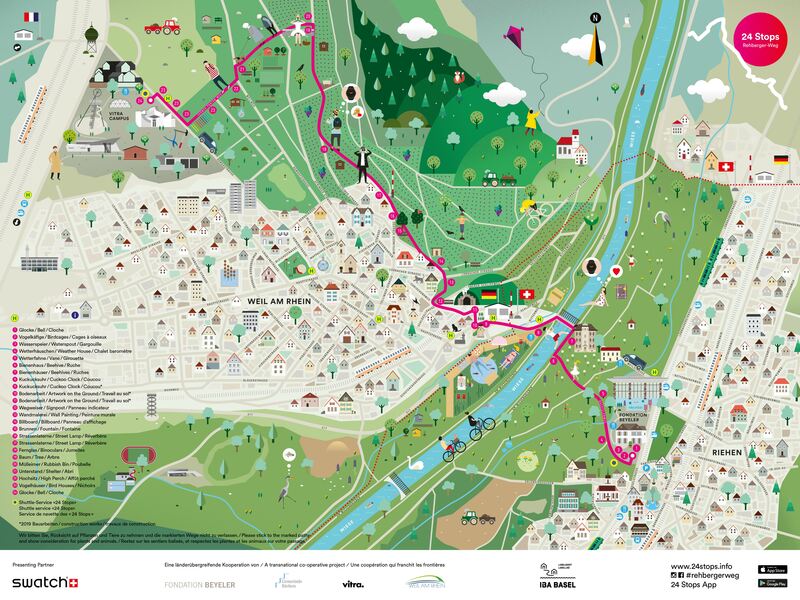 You can pick up a free, detailed route map from the friendly tourist information office at Bahnhof Basel SBB or the museum counter in Fondation Beyeler and on the Vitra Campus. Alternatively, download the map here. There is very little shelter en route or an opportunity to top up drinking water. Bring plenty of sunscreen and water. Are there unusual walks that you have done? I’d love it if you could share your experience by leaving a comment below. And if you have found this post useful, I’d be very grateful if you could share it via your social media or pin it to your Pinterest board for future reference.